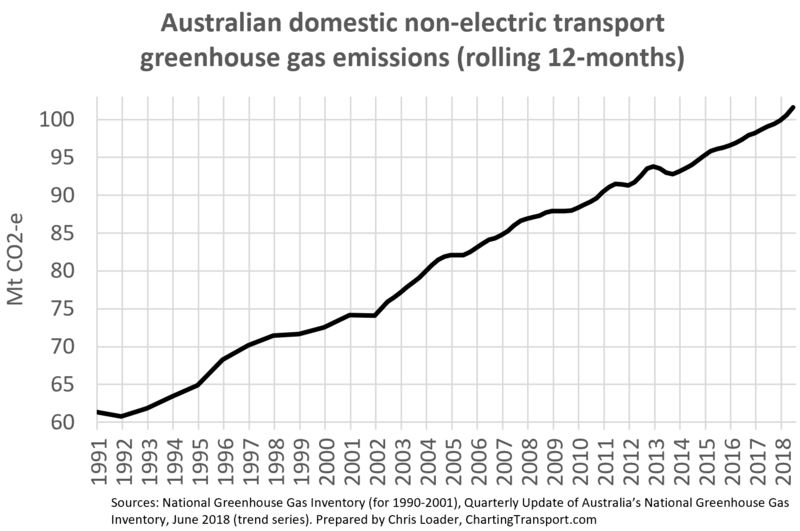 Currently Australia’s transport emissions are rising. This needs to be addressed as an urgent response to the climate crisis. See the Update on Australian transport trends (December 2018) from the Charting Transport blog. We have a climate emergency, the students want action on climate change, and that must also mean improving the public transport and cycling infrastructure along the Upfield corridor to enable mode shift. Moreland Council last week adopted a transformational policy to drive transport mode share shift: the Moreland Integrated Transport Strategy, but we also need the state government to step up and upgrade the Upfield line, instead of ignoring the growing public transport infrastructure needs in Melbourne’s north. “I don’t need to tell you there is a climate emergency. I don’t need to tell you that it is crucial what we are doing now will have an effect to safeguard the liveability of our planet. We have signed off on the Paris Agreement, the Labor Party is saying they will reduce emissions by 50 percent by 2030. Transport emissions are a major contributor to our emissions in Australia and they are going up. Electricity emissions are beginning to plateau because of all the renewables coming on line. Yeah renewables! However, transport emissions are going up. An interesting thing, do you know the amount of energy emissions to make your car are actually going to be more than you ever run it, unless you nearly drive it continously. So the mere fact that you own a car is the biggest contributor to emissions. My family live in West Coburg. We live in an area that was sub-divided in the 1920s and 30s. Our modes of transport are: 1 train; 2 trams, 4 bicycles and one car. We, as a family of four can have one car because we live in an area with good public transport. If we lived out here we would need two or three cars to get to work and uni, and that would triple our transport emissions, and that is why we need decent public transport so families like mine don’t have to buy into a huge carbon footprint for our planet. We can, because someone else has thought of it, use sustainable transport which is public transport. When they get the trains going on electricity which is generated by renewables sources, even better. It is the planning that has gone into that suburb that means I can live a much lower carbon footprint than if I was living out here. That shouldn’t be a burden on the people out here. The crisis of owning cars, of running cars means people are being locked in to a carbon dependent lifestyle. Money dependant wage slaves for their transport costs and it is just not right, just not fair. So we need to duplicate the Upfield Line Now for a sustainable Moreland. Entry filed under: public transport, rallies & protests, transport. Tags: public transport, Sustainable Transport, transport emissions, UpfieldLine.